Business with sound. Slim-business is en vogue. 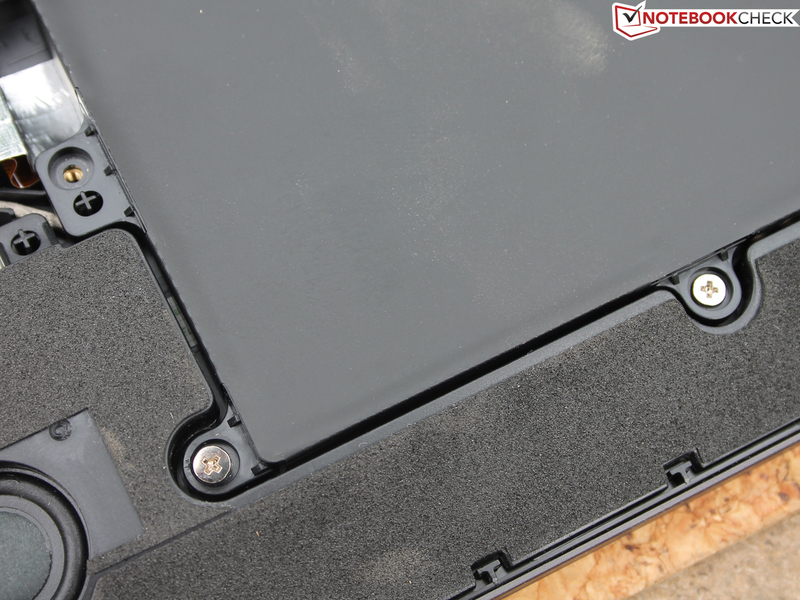 The Taiwanese manufacturer uses its aluminum unibody know-how from the Zenbooks and creates an impressive chassis. The keyboard features a long drop and the maintenance options are A-one. 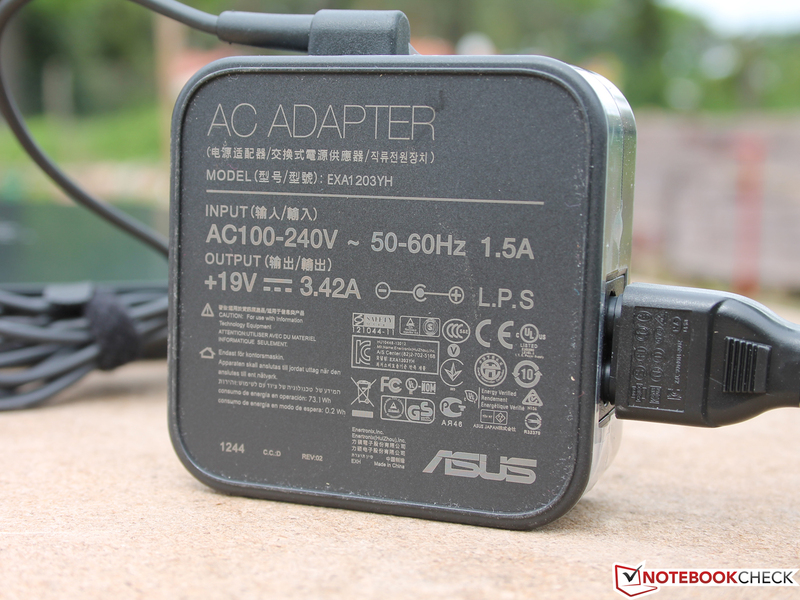 Regrettably, Asus blunders in one vital point. 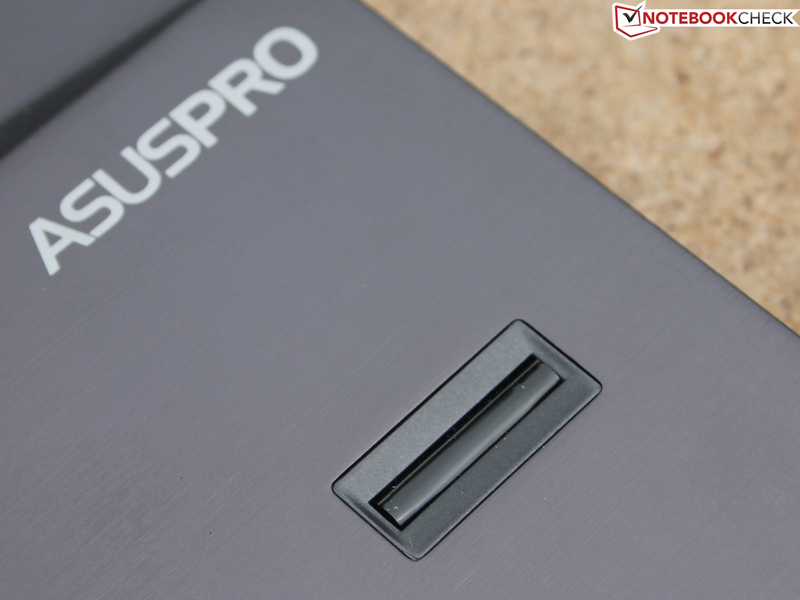 Asus is fairly new to the business sector with its ASUSPRO models. Devices that carry this label have only been around for about a year. Classic business traits, such as a docking station or DisplayPort, are now installed depending on the price bracket and series. For example, we praised the ASUSPRO B53V for its impeccable ergonomics and battery life, but reproached it for its inferior keyboard. The manufacturer exhibited its advancement in the field of ultrabooks for the first time at the CeBit 2013. The ASUSPRO BU400VC is a 14 incher, like most of its direct contenders. HP's EliteBook Folio 9470m, Lenovo's ThinkPad T430u and X1 Carbon and Dell's Latitude 6430u are examples of such work devices. 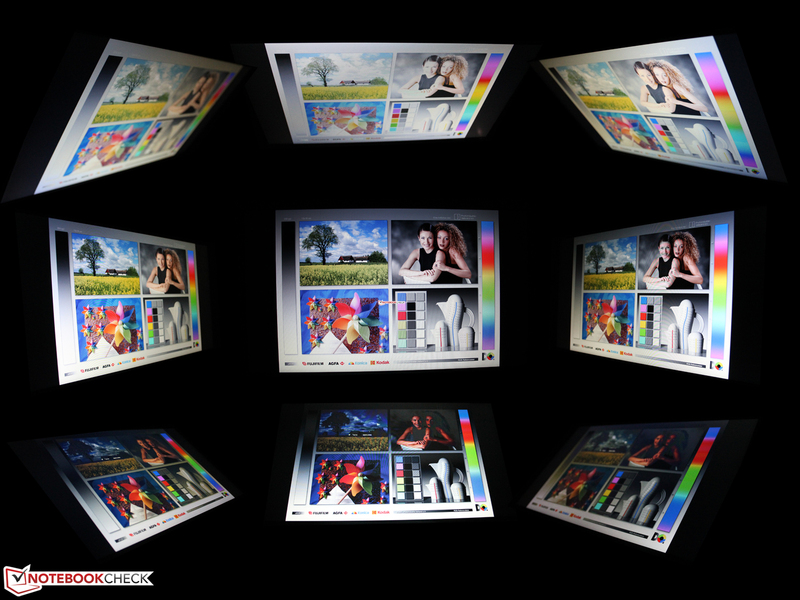 What kind of quality can potential buyers expect from in the HD screen with a resolution of just 1366x768 pixels? Has Asus only modified the first-rate chassis of the Zenbook UX series or are we dealing with an absolutely new casing? Which business qualities have been sacrificed to meet the ultrabook criteria? 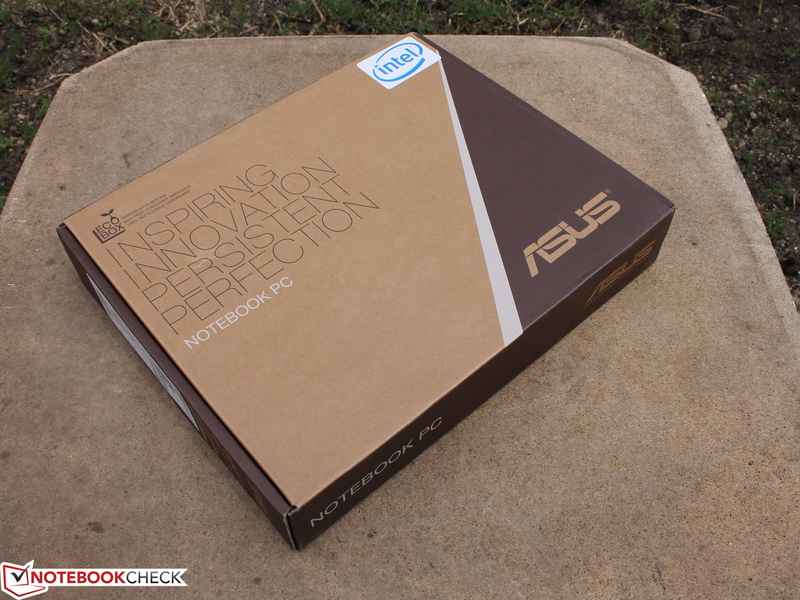 The Zenbook Prime models set standards in terms of build over a year ago. 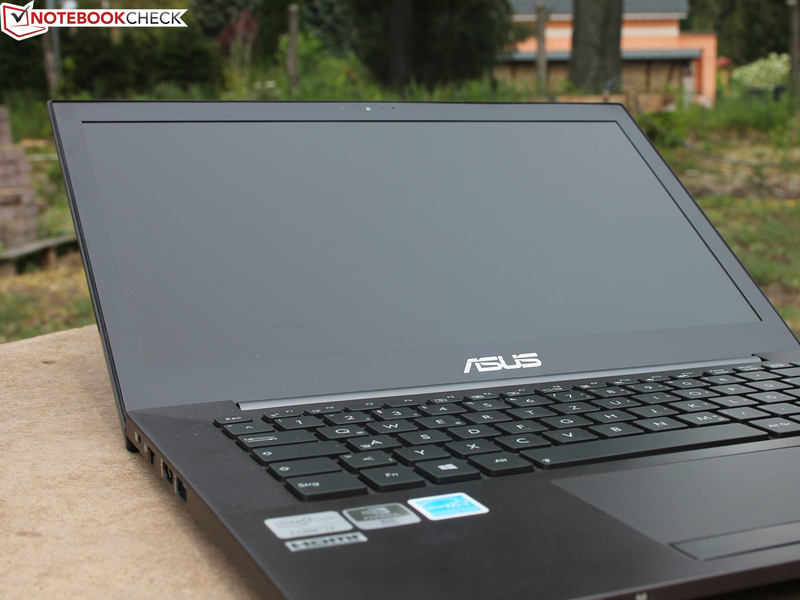 Has Asus simply modified its successful chassis a bit for business use? It is in fact a completely new barebone although the general structure is similar. 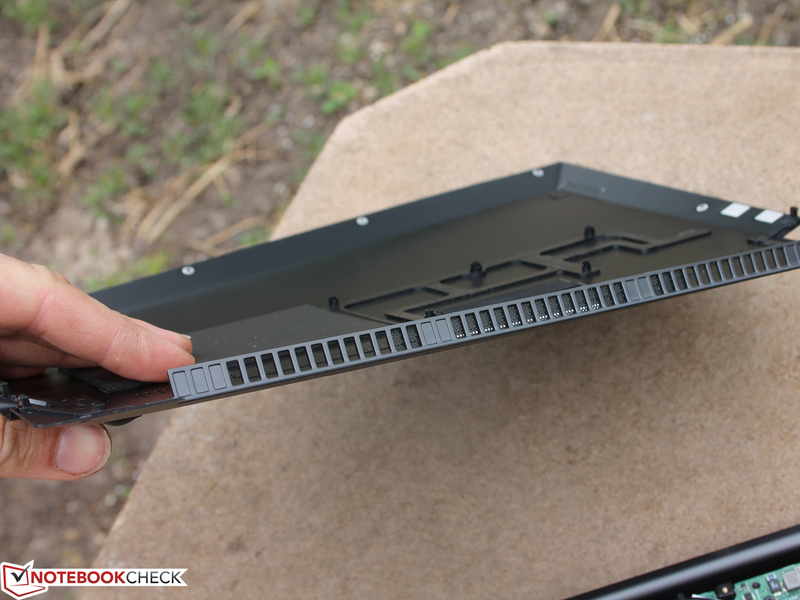 Like the UX31A, the upper tray of the base unit is made of one piece. The keyboard and motherboard/drives are inserted from the bottom. The whole thing is closed with an aluminum plate from below. The screws of the latter are visible and allow easy opening. The hinge is submerged in the base and the vent is directly below that. Asus adopts the typical architecture and aluminum unibody concept from the Zenbooks, but increases the screen diagonal from 13.3 to 14 inches. Consequently, the width and depth have also increased by roughly one centimeter. The key height, interfaces and the thicker lid result in a thickness of 21 mm rather than 18 mm from the UX31A. 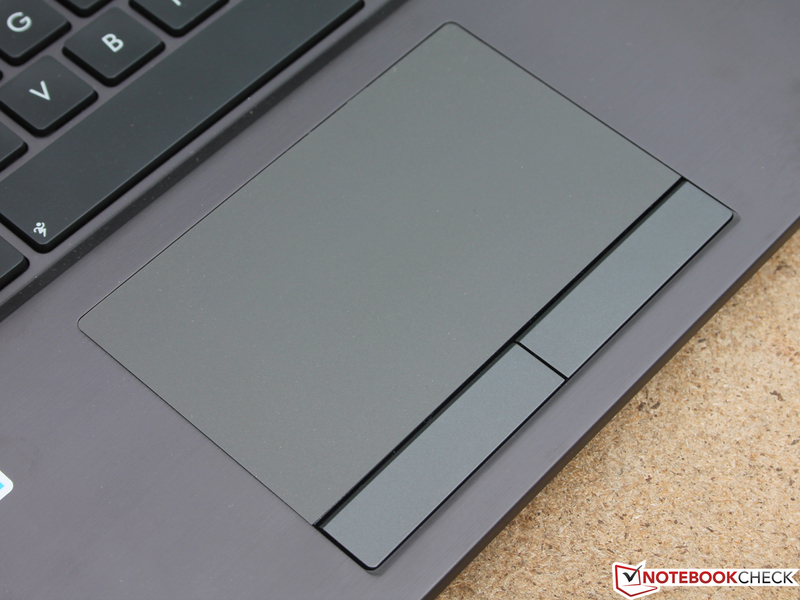 The angular design and the dark, anodized, brushed aluminum cannot be mistaken for a Zenbook. The chassis not only makes a "hard and angular" impression, it is in fact as stiff as a board. This is also true to a very large extent for the lid. Its surface is very firm, the hinge has a firm grip on the display and torsional forces that occur during rough handling barely have an effect on it. The material gives the surfaces a cool, metal-like feel. We could not dent the closed base plate anywhere. Two fans supply the casing's innards with cool air via a small row of air vents. The BU400VC has three-millimeter high feet to prevent them from being clogged, for example on a smooth desk. 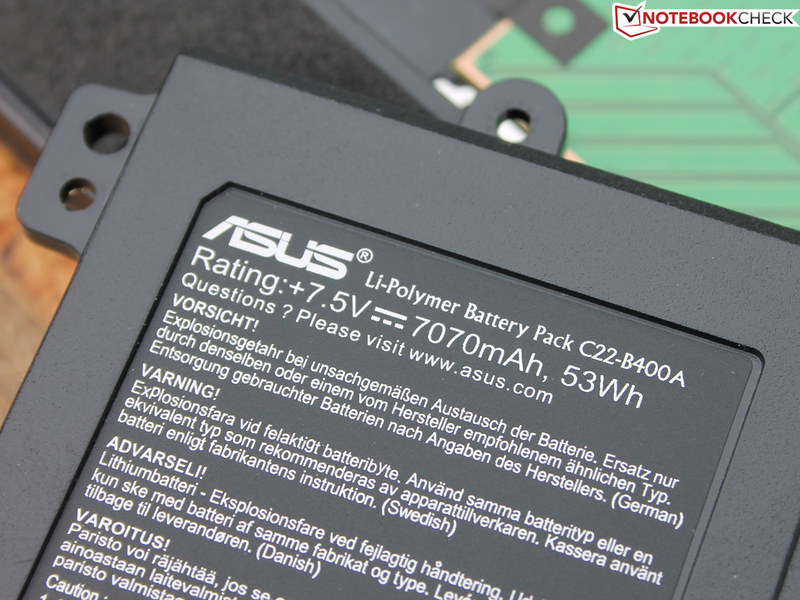 As usual, Asus has not considered them in the device's size specifications. "Fans" is the keyword that takes us to the innards. While the UX31A only features one fan, our BU400VC has two of them. One is necessary due to the dedicated graphics card, which not every BU400 features (BU400A: HD 4000 alternative). 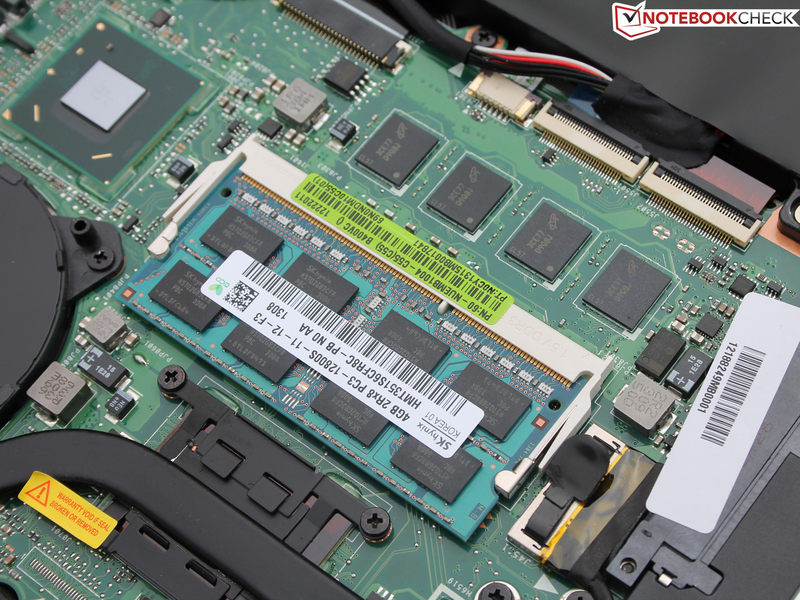 The conventional 2.5-inch SATA slot, the inserted RAM bar and the Wi-Fi module are easy to maintain considering it is an ultrabook. 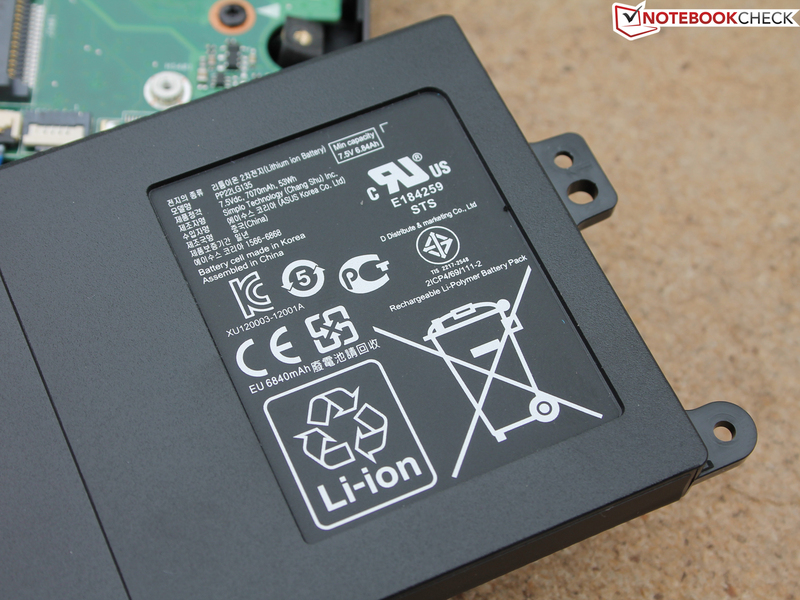 The built-in battery can also be removed and an mSATA slot, labeled "SSD", is empty. 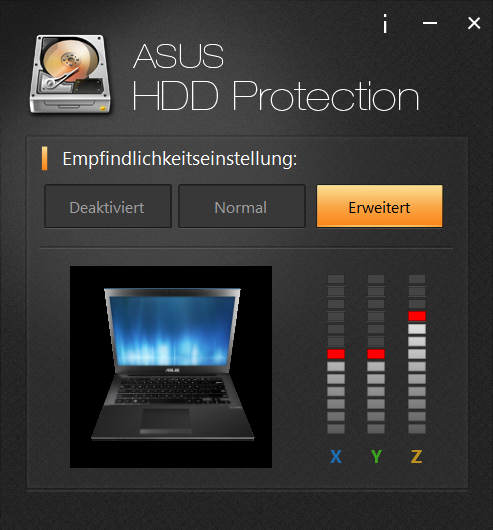 All this allows Asus or upgrade-eager users to configure the device with only HDDs or combinations of HDDs and mSATA SSDs to the same extent. 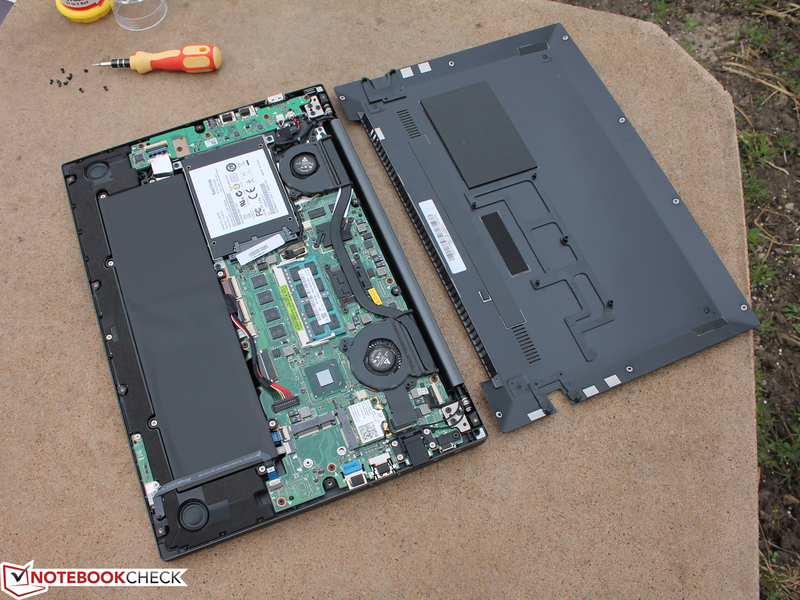 We last saw such good maintenance options in the EliteBook Folio 9470m, Latitude 6430u and ThinkPad T430u. 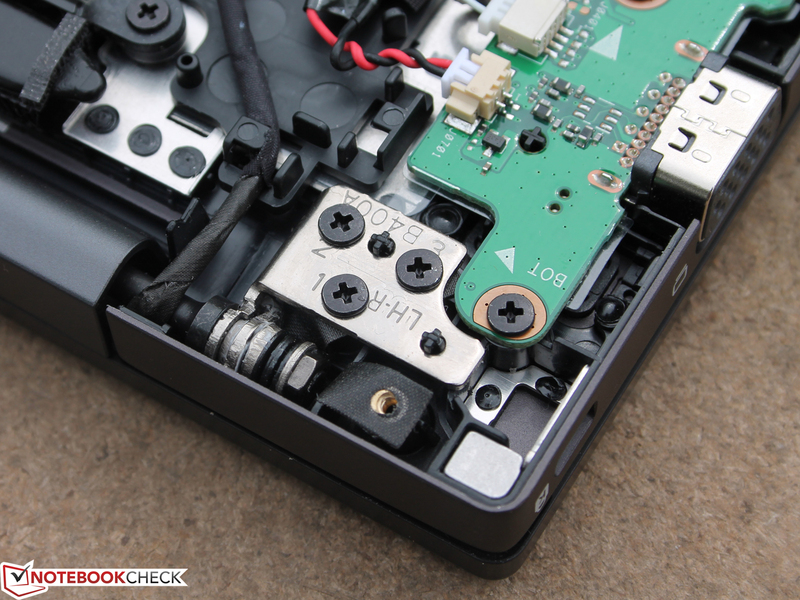 The X1 Carbon does not feature a 2.5-inch slot and is an exception among the contenders with its soldered RAM. 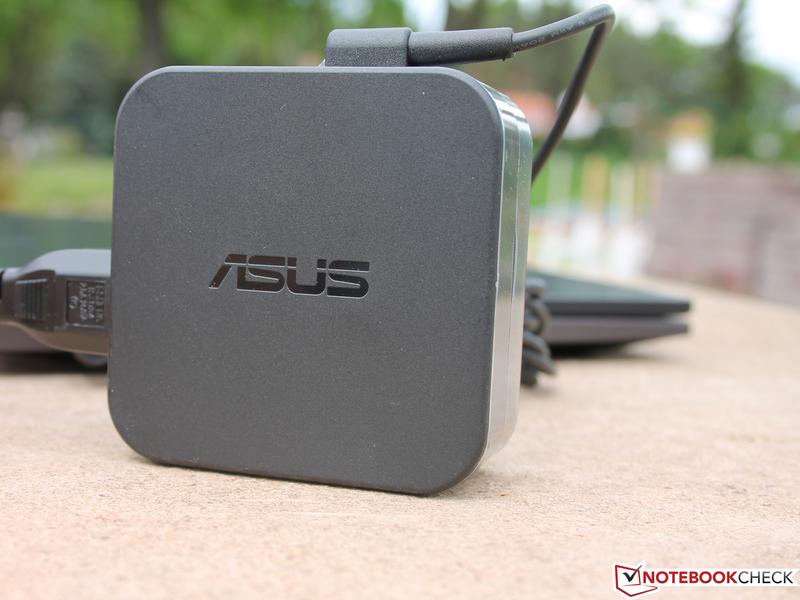 As is customary for business devices, Asus does not omit Ethernet or VGA ports. The X1 Carbon is the only device that does not provide these interfaces. 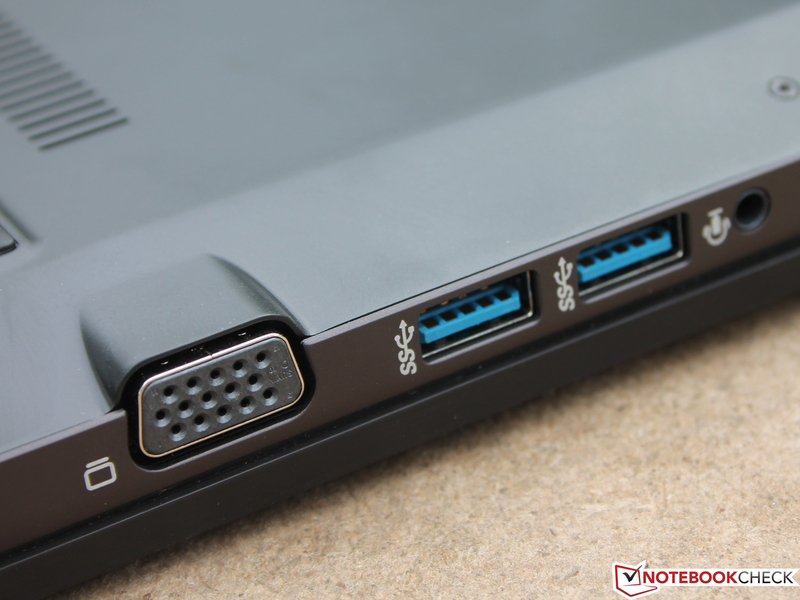 The ports are positioned very nicely on the chassis; Asus always uses the rear left and right area. Interfaces on the rear would be handy for frequent desktop use and would reduce the visible cable mess. 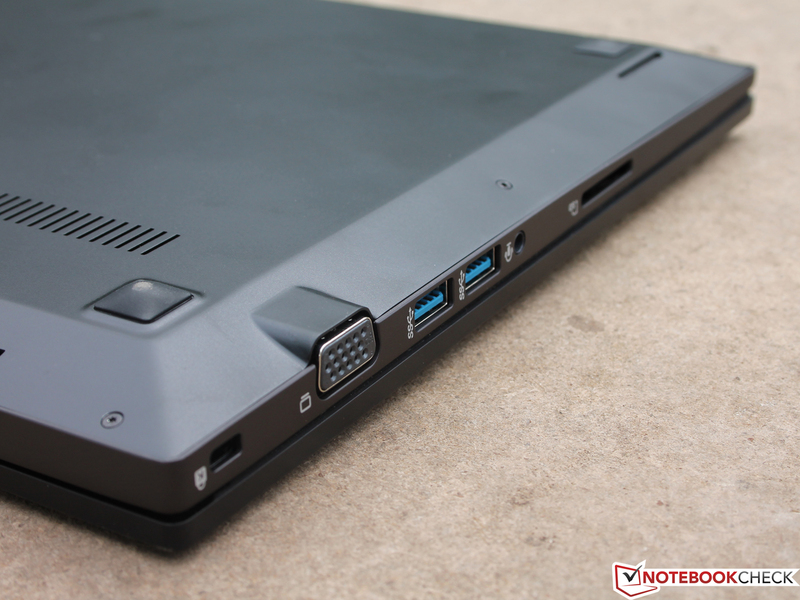 The T430u and Latitude 6430u are the only devices that feature rear-positioned ports among the contenders. Gigabit network and Advanced-N Wi-Fi cards have become standard. Intel's Centrino Advanced-N 6235 not only supplies the Bluetooth 4.0 module, it also supports the extended 5 GHz frequency bandwidth (dual-band). This enables using the less busy frequency when interferences occur on the 2.5 band or when it is overloaded. The range proved to be very good although our router's signal was reduced to 50%. One bar was still displayed even 40 meters (131 feet) outside of the building and the contact was not disrupted when out of line of sight. A 3G/LTE modem is not available as standard for the BU400. Users would have to fall back on smartphone tethering for this. 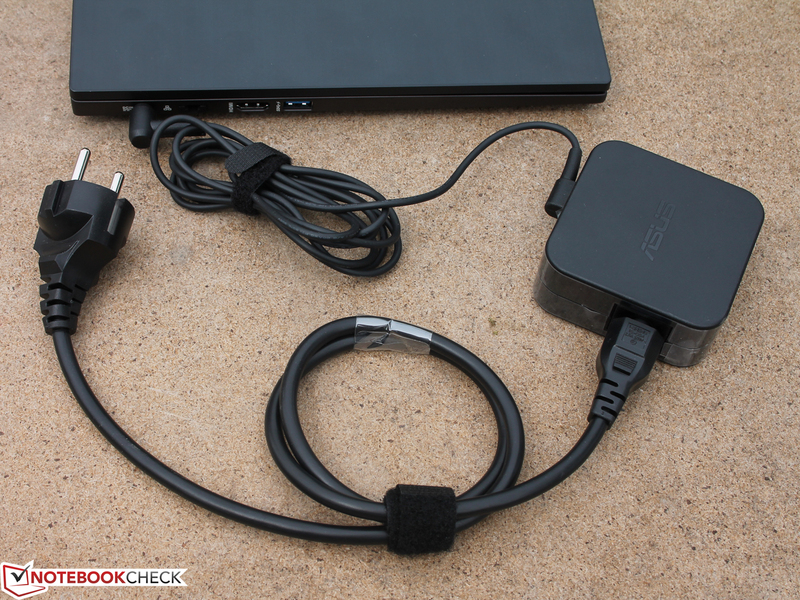 Asus supplies a tool called Instant Connect for setting this up. As for security, the BU400VC features a fingerprint reader on the wrist rest in addition to the standard Kensington lock. 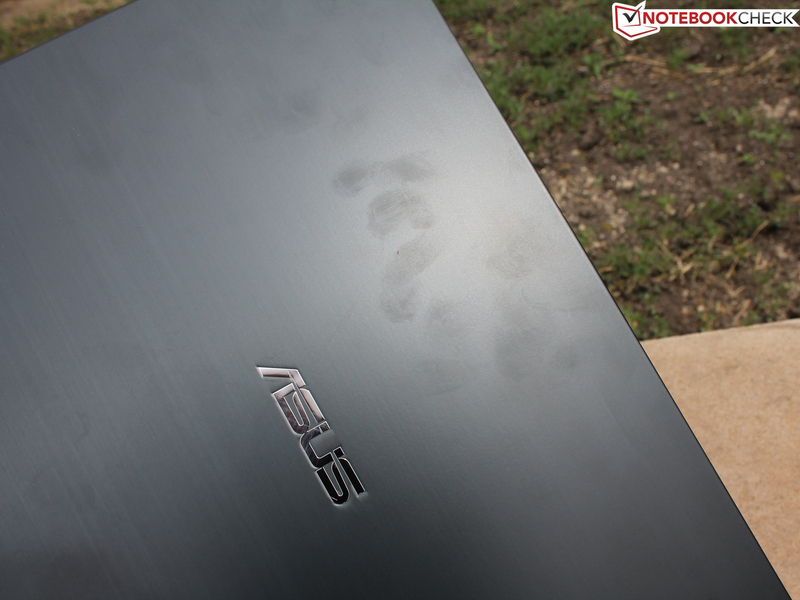 The fingerprint reader can be mapped via the Asus Fingerprint tool. Then it is possible to easily login on the BU400VC with the finger. 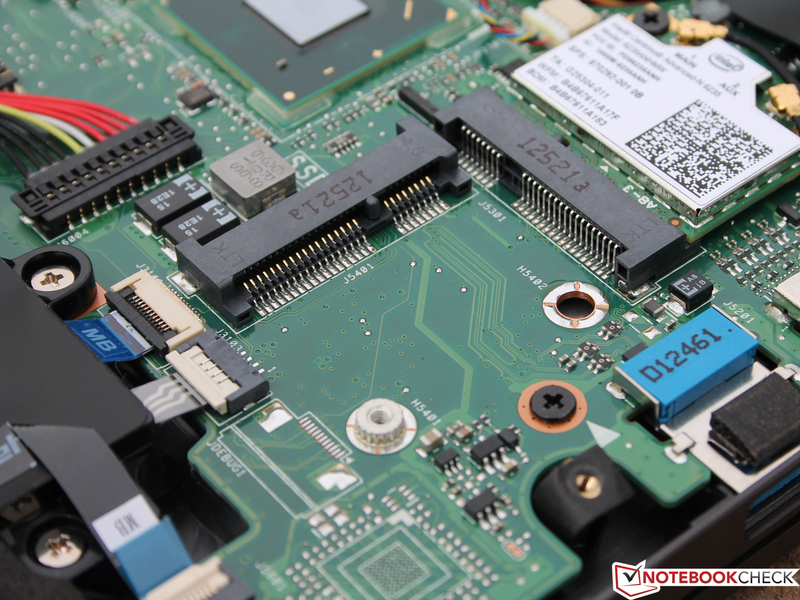 A TPM module is also installed and allows the unambiguous authentication of the ultrabook. The latter can be enabled and disabled in the BIOS, just like Intel's Anti-Theft. The HDD Protection tool is installed for configurations based on an HDD (BU400A). The BU400VC does not feature other security tools or comprehensive BIOS settings, like specifically in HP's ProBooks and EliteBooks. 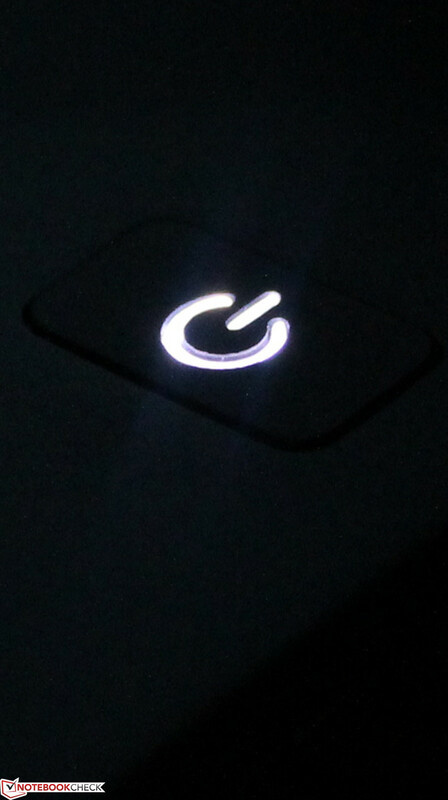 The BIOS settings are however more extensive than in many consumer devices (lock single devices, USB charger during battery mode on/off, admin passwords, etc.). Only the now squarish power supply unit, the Windows 8 DVD and a cable tie are in the box. 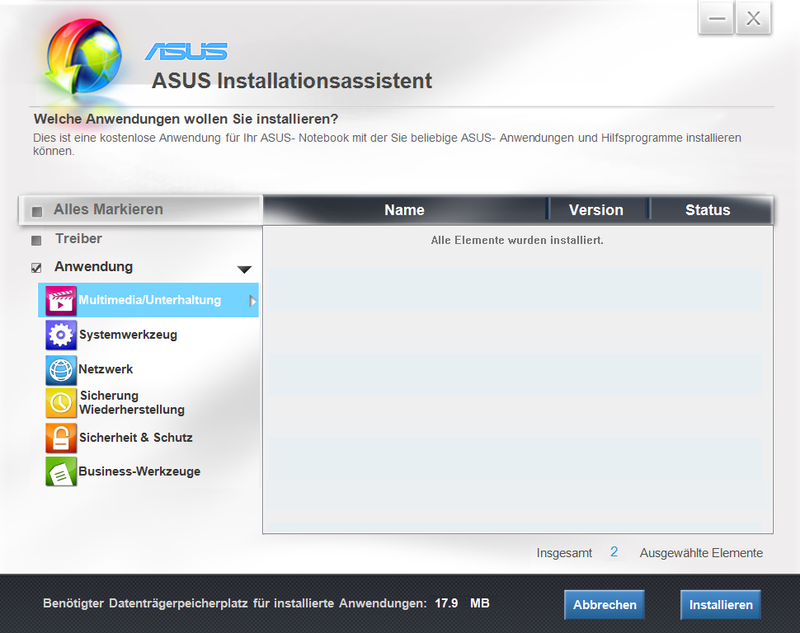 Asus preinstalls Windows 7 Professional 64-bit in its BU400VC and thus satisfies the demand of many companies. However, changing to Windows 8 is simple because a Win 8 recovery DVD is included. Asus Install installs Asus' proprietary tools and applications although the selection is filled with gaping emptiness. 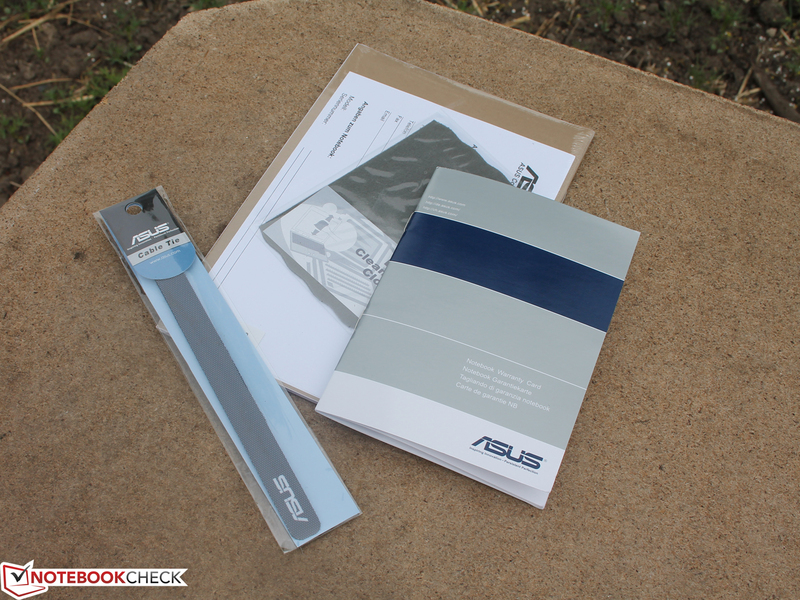 Asus includes a 24-month manufacturer's warranty ex-factory. 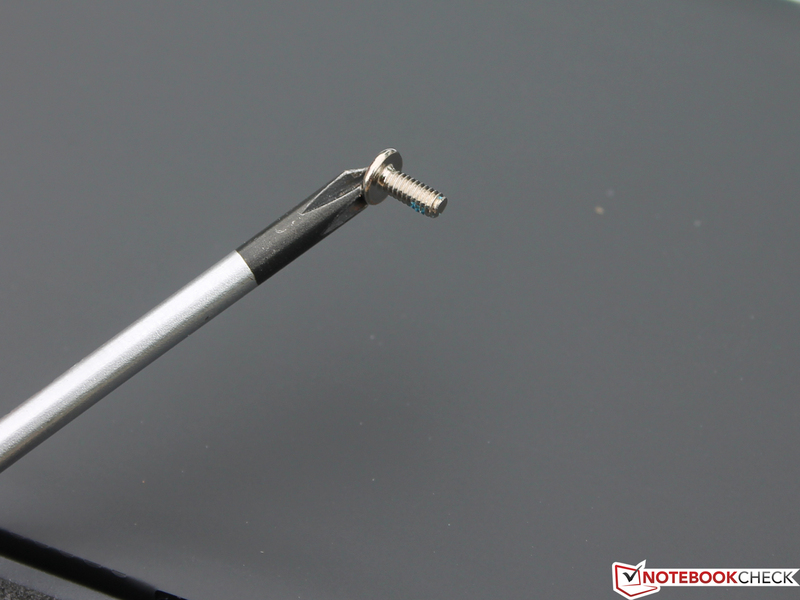 It is a pick-up & return service so that a defect BU400VC is collected from the customer. The upgrade package for around 70 Euros (~$91) referred to a Next Business Day OnSite Service includes a 2-year on-site service in Germany. Users who want to upgrade the warranty to a total of three years can do this for around 85 Euros (~$111). 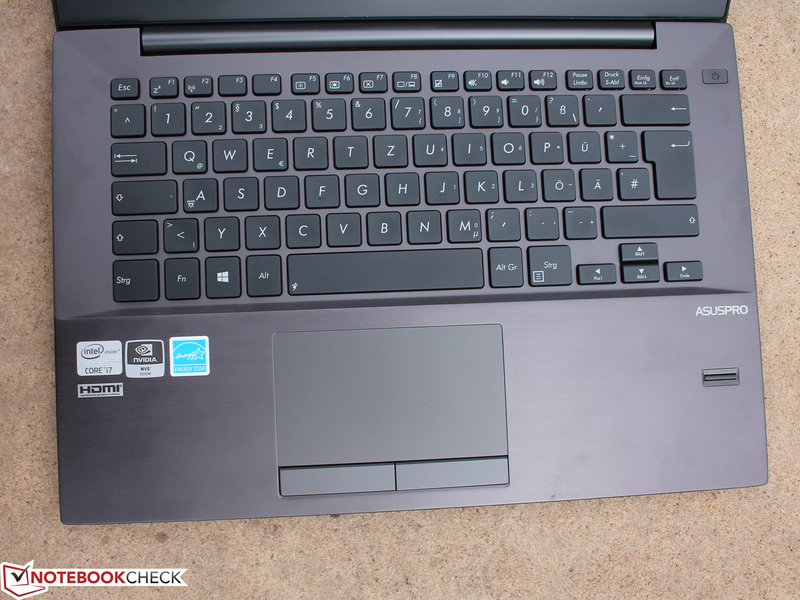 Asus installs a chiclet keyboard with slightly conical keys and outstanding feedback. This pleasant surprise is due to the clear key drop of 2.5 mm, which is rare for laptop conditions. The keys feature a soft, slightly spongy stop and yield to pressure by an additional half a millimeter. Thus, users who type vigorously will experience a pliable, clear drop of up to three millimeters. 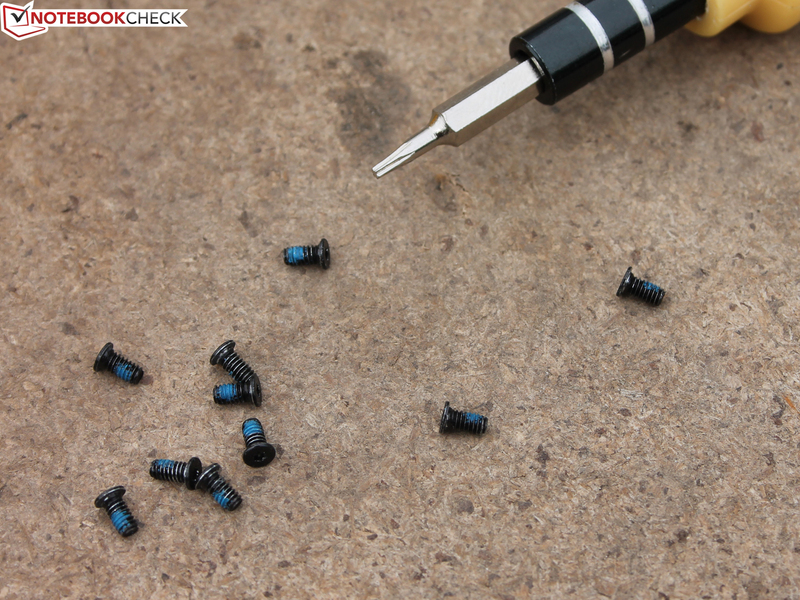 For comparison, the tester's mechanical keyboard features a drop of approximately four millimeters. 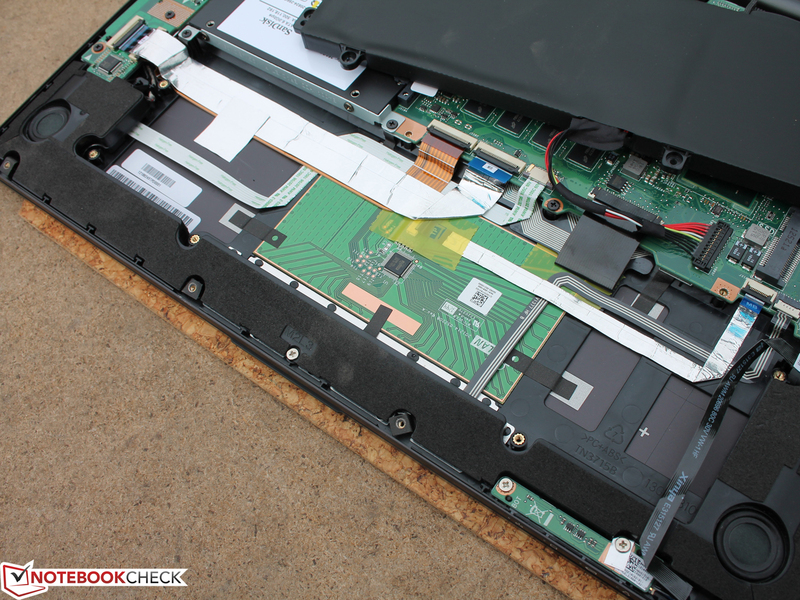 Most laptop keyboards have a drop of two millimeters. The pressure point is clearly defined in the first third of the drop. 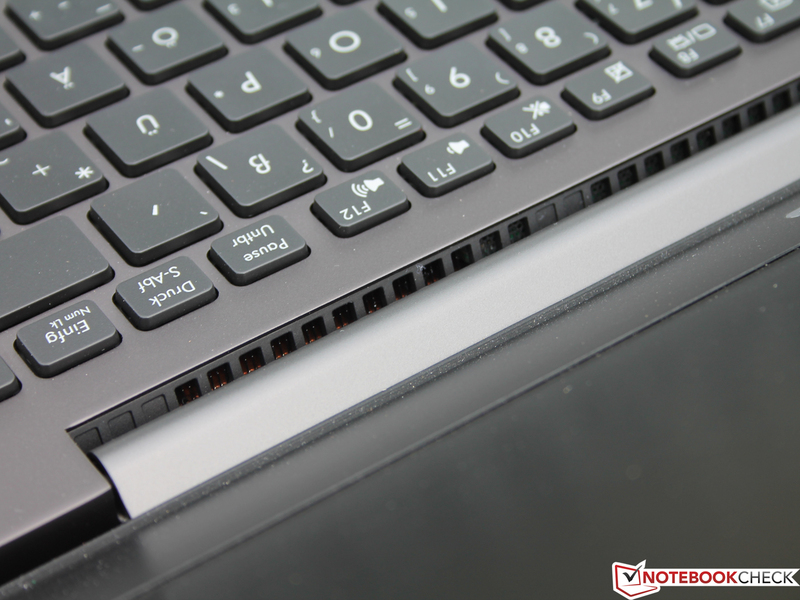 If the keys did not have a slightly spongy stop, the keyboard would be perfect and could easily compete with the premium units in Dell's Latitude E-series or HP's EliteBook. The generous layout, the separated arrow keys and the wide key gap of 3.5 millimeters complete the package. ClickPad? Trendy gimmicks are unwanted in the business sector. Asus uses conventional mouse keys and omits a TrackPoint. The clickable keys are hard, have a light rubbery feel and a clear drop of almost two millimeters. The pad has a diagonal of 12.2 cm (~4.8 inches) and is not completely sensitive up into the edges. The Elan SmartPad supports multi-touch gestures (zoom, scroll, etc.) but does not feature a horizontal/vertical scroll bar. Also, an Elan tool (mouse properties) to accurately calibrate the input device (scroll bars, sensitive areas) has been omitted. 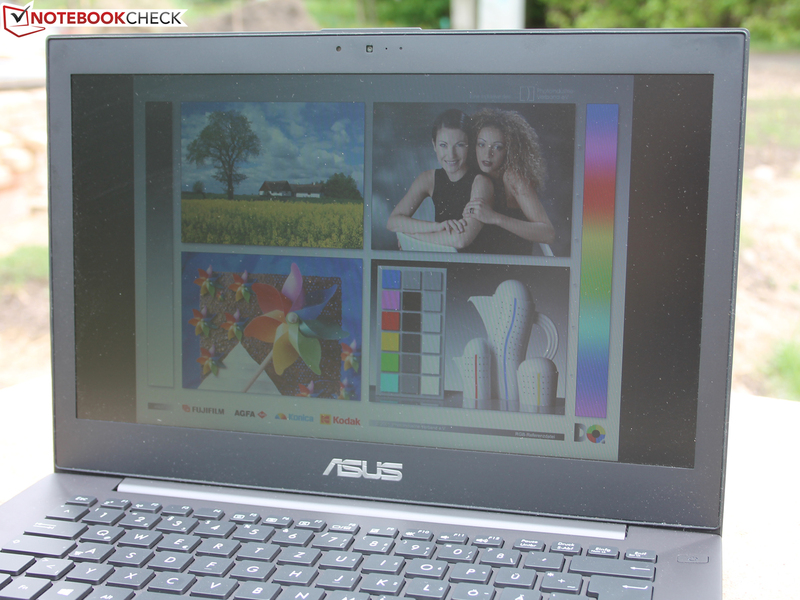 Asus installs an HD screen with a resolution of 1366x768 pixels. The 14-inch AUO B140XW02 V1 (TN) thus has a pixel density of only 112 ppi. Some potential buyers will be disappointed that the manufacturer does not offer an alternative resolution. The competition optionally offers HD+ (1600x900; 131 ppi): ThinkPad X1 Carbon, Latitude 6430u, EliteBook Folio 9470m. 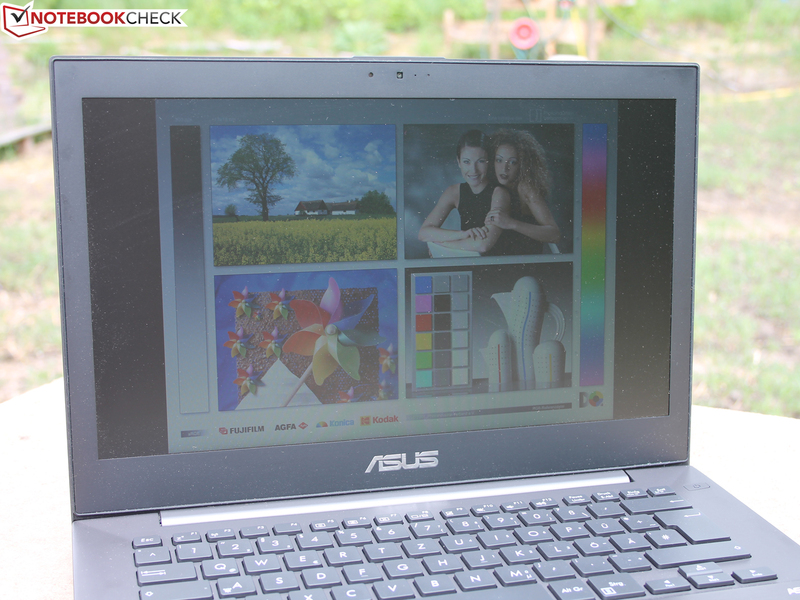 The matte screen achieves a high contrast of 995:1 but only an average brightness of 177 cd/m². The maximum, adjustable brightness remains unchanged in battery mode (brightest spot: 193 cd/m² center). The illumination is acceptable; screen bleeding was not visible on a black screen. 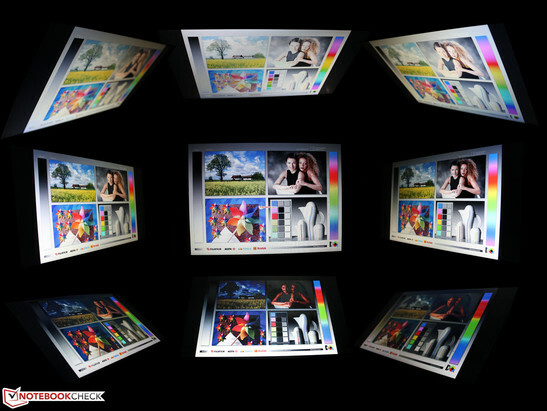 Professional DTP use is not recommended due to the low 52% coverage of the sRGB color space from the AUO panel. The BU400VC is on a par with all its contenders in this point, including minor differences. We measured the screen before calibrating it. The CalMAN tool uses the photo spectrometer X-Rite i1 Pro for analyzing the color accuracy and grayscale in relation to sRGB (target color space). The BU400VC reproduces the grayscale very poorly; a bluish cast is clearly visible in screenshot 1 (Delta-E 2000 of 8-15). The white point (CCT 7,633 K at 100% white) is remote from the ideal of 6,500 K. The bluish cast disappears a bit after calibration and is very visible to the naked eye. The Delta-E 2000 decreases to almost six. The color accuracy continues the negative trend; the bluish cast is omnipresent. The color space in the color saturation screenshot shows that magenta and cyan clearly drift toward blue. The RGB balance is correspondingly uneven. Even red shows a Delta E 2000 of over ten. Color deviations are visible to the layman from a Delta E 2000 of about three. The assessment of the same shows how vital a calibration can be. Cyan then corresponds to the norm but the visible bluish trend in red and magenta remain though. However, an agreeable color improvement is achieved for the viewer visually. In comparison, we have to note that HP's Folio 9470m, Lenovo's X1 Carbon and Latitude 6430u (HD+) show roughly the same poor color saturation qualities and intense bluish cast without calibration. IPS consumer laptops, such as the UX31A Touch (FHD), are better although they also show weaknesses in the grayscale (Delta-E 2000: 8). Owing to the TFT's matte surface and its contrast, using the BU400VC outdoors is theoretically possible. However, the perfect picture remains unreached due to the low brightness. The desktop is too dark in bright sunlight. The following photos were taken in overcast conditions and are therefore advantageous for the test device. The above-mentioned bluish cast improves the TN screen's possible lateral viewing angles to an extent. However, they cannot be called good. Pictures start to invert at just 15 degrees vertically. We see ghosting at approximately 50 degrees horizontally, as it is typical for TN screens. None of the contenders is really better here because all feature this TN screen type. IPS screens, like in the Zenbook Prime UX31A consumer device, show just how pleasant wide viewing angles can be. This is however not always wanted in business devices, (privacy, third-party viewers). The Core i7-3517U (2x 1.9 GHz) is a low voltage processor for subnotebooks. 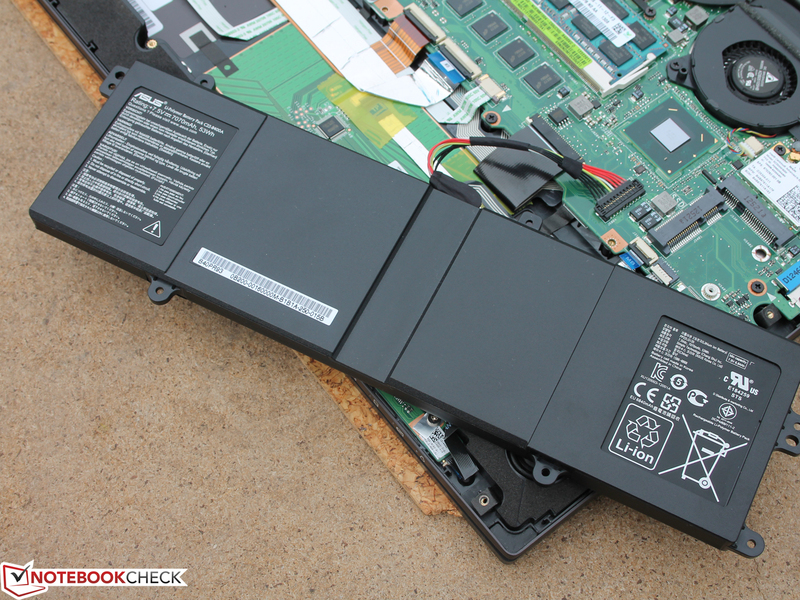 Low voltage refers to the TDP of 17 Watts. 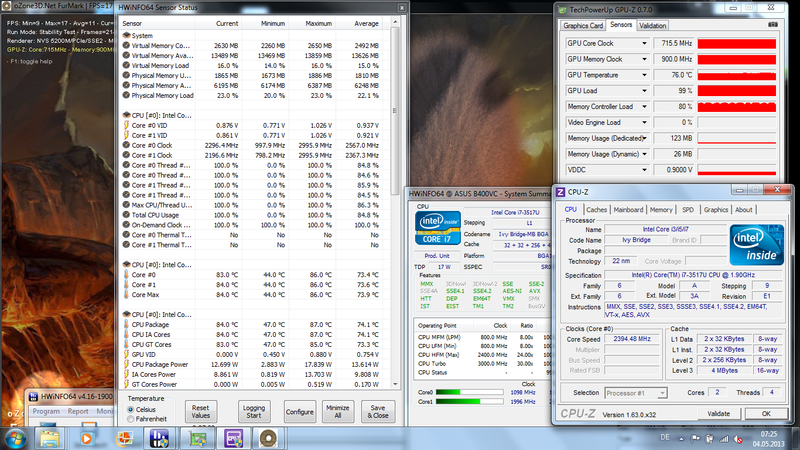 For comparison, standard processors have 35 Watts. 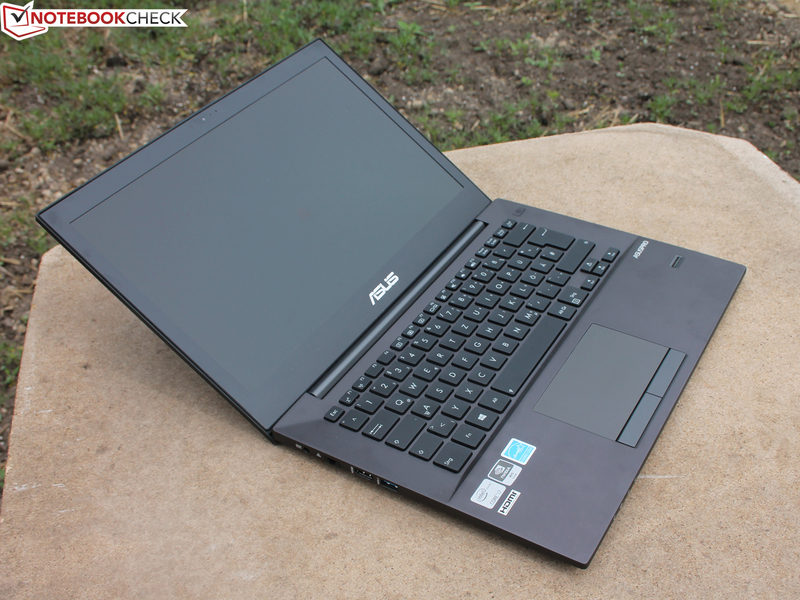 The ultrabook CPU has a higher performance than the Core i5-3317U in the BU400A. 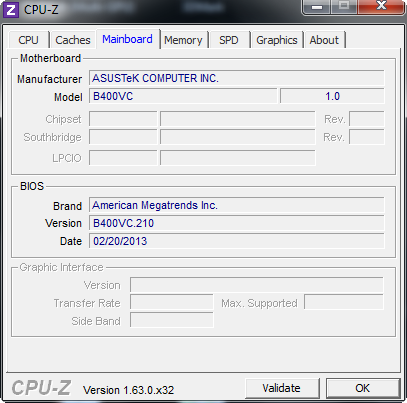 Asus offers the BU400 with a 3317U only as an option. Theoretically, the clock rate can be increased to 3.0 GHz providing that the cooling is sufficient (Turbo Boost 2.0 @ single-core load). 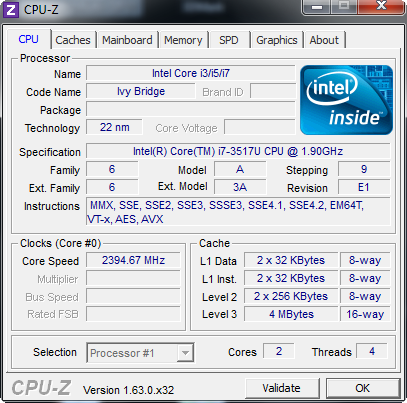 The Ivy Bridge i7 incorporates Intel's HD 4000 and the memory controller for the installed eight GB of working memory. 4096 MB are on-board and another four GB are inserted as a DIMM module. 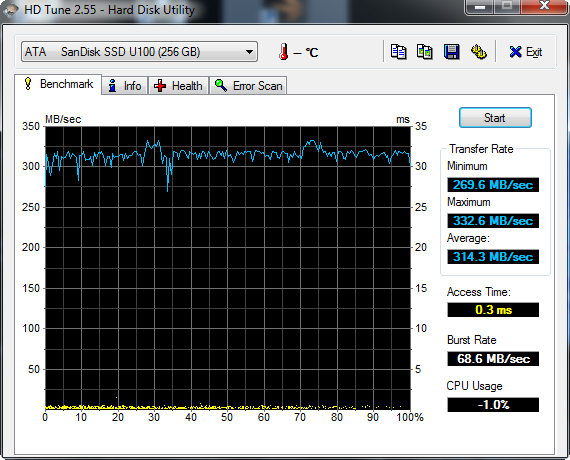 The hard drive is a SanDisk U100 256 GB SSD (SDSA5GK-256G-1002). The i7 version of the BU400VC with a 256 GB SSD is sold for steep 1240 Euros (~$1617). Would a less expensive i5 alternative, which is available for starting at 900 Euros (~$1173) depending on the configuration, be enough? The Cinebench test shows that there is only a 13% performance difference to the i5-3317U (T430u). Other i5s with a marginally different clock rate even only lag 4 to 7% behind the i7 depending on the Turbo Boost utilization. The user does not have to waive on performance in battery mode. The R11.5 tests (incl. 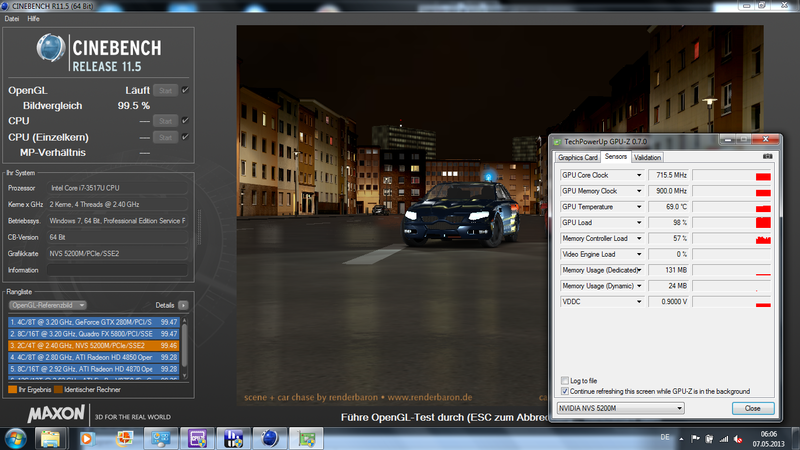 OpenGL GPU test) finished with the same scores as in AC mode. To what extent is the Turbo range maxed out? We ran a Prime95 multi-test and recorded a steady CPU clock of 2.8 GHz. The CPU's temperature was 83 degrees Celsius (181.4 Fahrenheit / HWinfo). As we will ascertain in the ergonomics part, the clock rate decreases unsteadily when graphics power is required at the same time. Solely performed GPU tests (screenshots 1 + 2, R11.5 OpenGL) ran stably at 1150 MHz on the HD 4000 and at 715 MHz on the NVS 5200M (each core). Both PCMark 7 and the older PCMark Vantage rate the overall application performance, in which the HDD, RAM, CPU and GPU undergo a series of tests. The scores are within the range of what was expected with 3283 and 10080 points. The contending devices are better because they simply sport swifter SSD models. 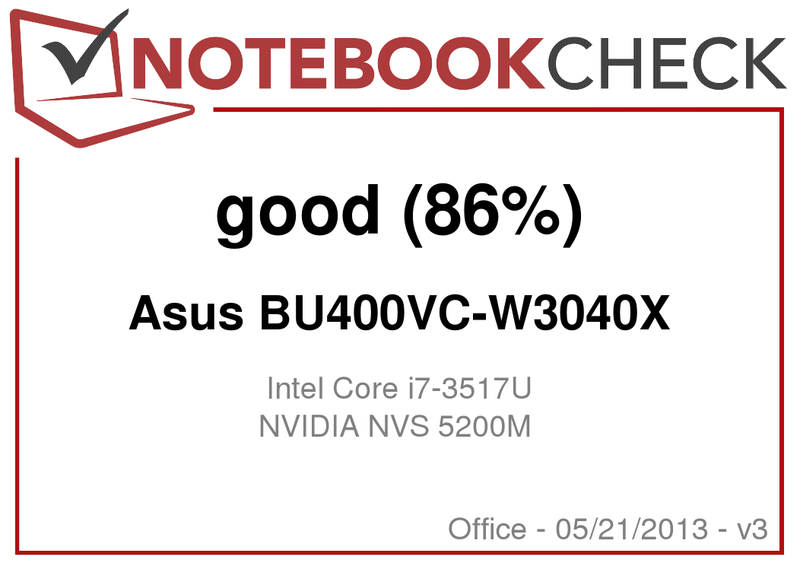 This is seen in the System Storage and HDD score of both PCMarks. 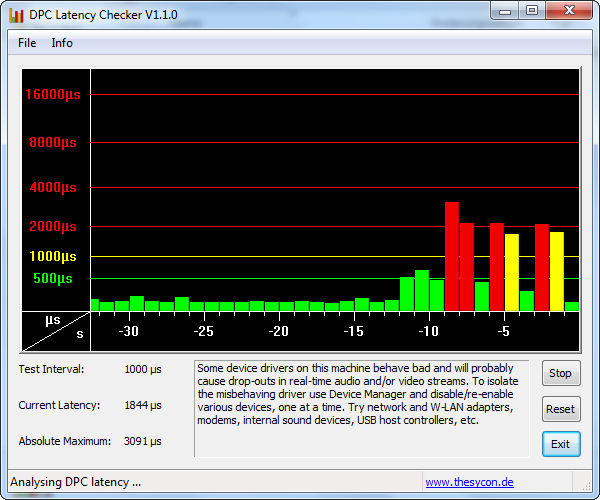 The SanDisk U100 in our test device lags behind by up to 38 and 227% here. This might sound disconcerting but it does not affect the experienced application performance. The system is always faster than an HDD-only version (BU400). Programs load faster and a cold system start needs less than 10 seconds. The combination of a mechanical 500 GB HDD and a 128 GB SSD (BU400VC-W3041X) provides the best qualities of both worlds. A slow SSD? Are 455 MB/s not enough? The rates in sequential read and write (289 MB/s) belie a fact. Many SSDs are designed for fast read / write throughputs (for advertising purposes) but neglect both the 4K or even 512K test, which are more important for Window’s routines (small scattered files). 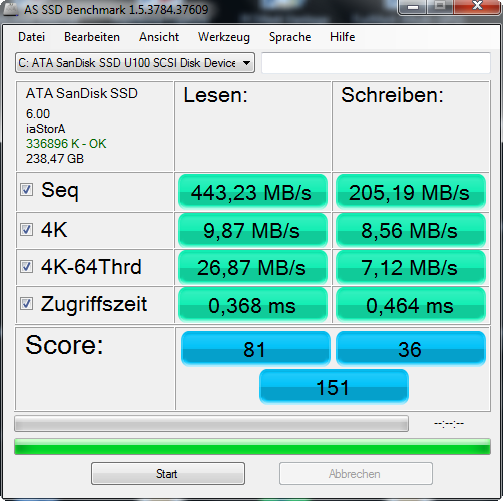 The score of our SanDisk U100 is not bad in this point but other SSD models run 24 to 78% faster. We cannot confirm an excellent speed because the 4K read rate is only 14 or 10 MB/s depending on the tool. 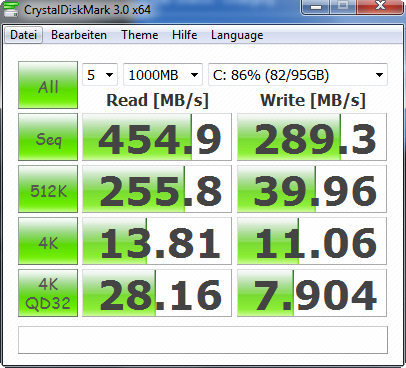 The fastest SSDs run with 20 to 25 MB/s here (X1 Carbon, SanDisk SD5SB2128G). The SanDisk U100 SDSA5GK-256G-1002 model with a gross capacity of 256 GB features the standard 2.5-inch SATA size with a height of 7 mm. It is connected to a SATA 6 GB/s. 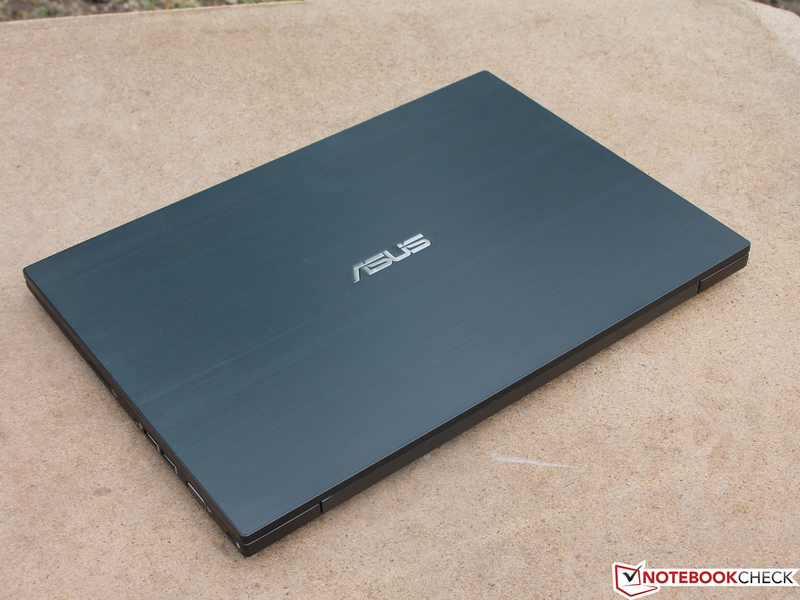 Consequently, a conventional laptop HDD can also be inserted and Asus does this in other models, such as ASUSPRO BU400A: HDD-only; BU400VC: HDD 500 GB + 128 GB mSATA SSD). Nvidia’s NVS 5200M graphics card is specially designed for the needs of professional users and is primarily to ensure stability. 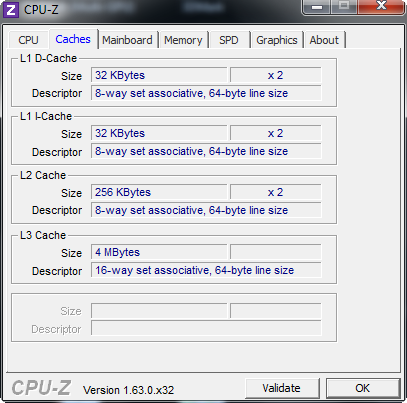 The graphics processor can be used for general calculations via CUDA and OpenCL, which unloads the main processor. The NVS 5200M is not worthwhile for users who mainly run MS Office programs with Internet applications, Excel, Word, Outlook, etc. on the BU400VC. 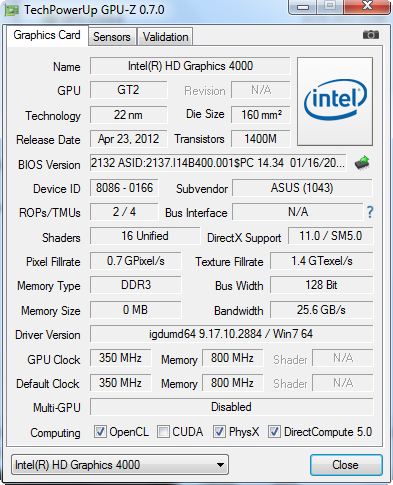 The BU400A model with only Intel's HD 4000 suffices for these requirements. 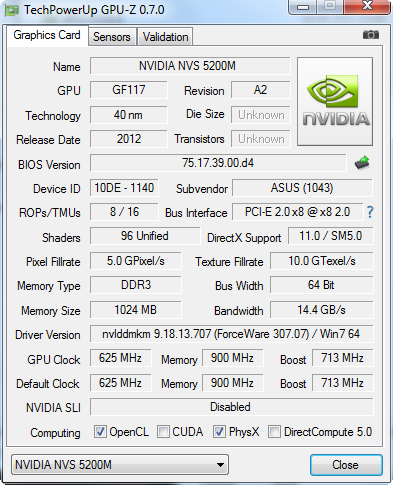 Nvidia’s proven Optimus dynamically switches between the HD 4000 processor graphics and the NVS 5200M in our test device. Since a less expensive HD 4000-only model is available, it is questionable whether the small NVS 5200M is at all worthwhile or whether the HD 4000 would now calculate almost as fast. The synthetic benchmarks confirm that it is worth the small surcharge. The above Cinebench R11.5 OpenGL test as well as the conventional consumer 3D benchmarks record a performance increase of approximately 40 to 50% compared with a standard ultrabook HD 4000. 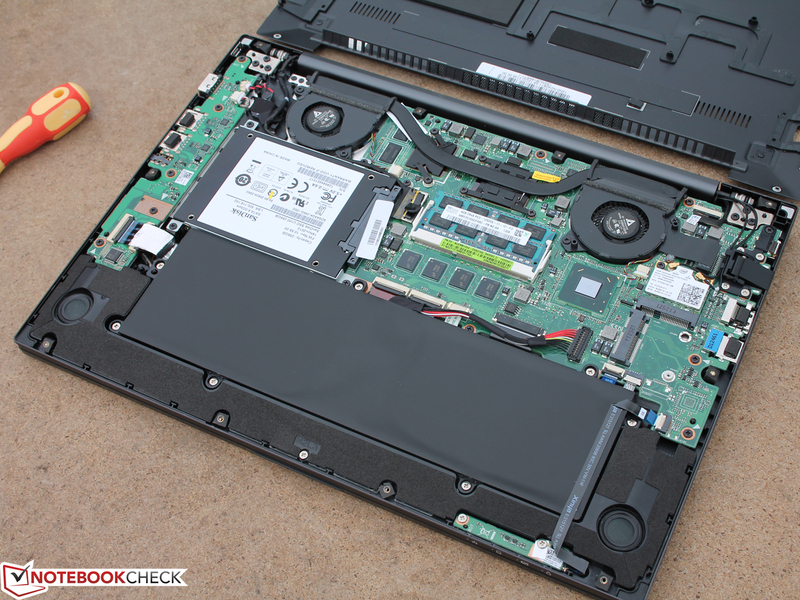 The GT 620M in the ThinkPad T430u is roughly on a par with -12%. The Cloud Gate test of 3DMark 2013 does not show any difference. 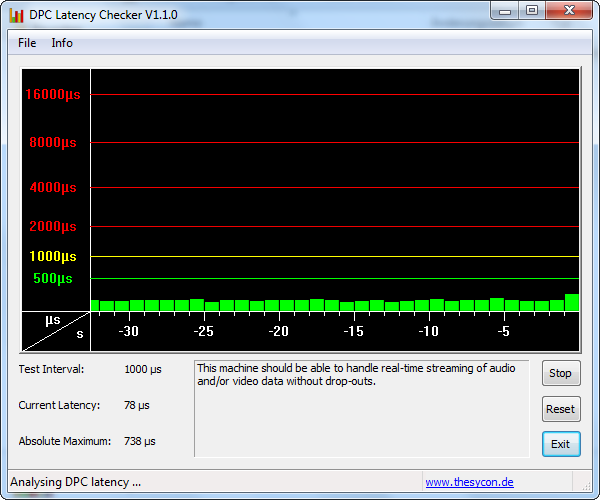 The reason for this is that the test only considers the HD 4000 and ignores the NVS 5200M. 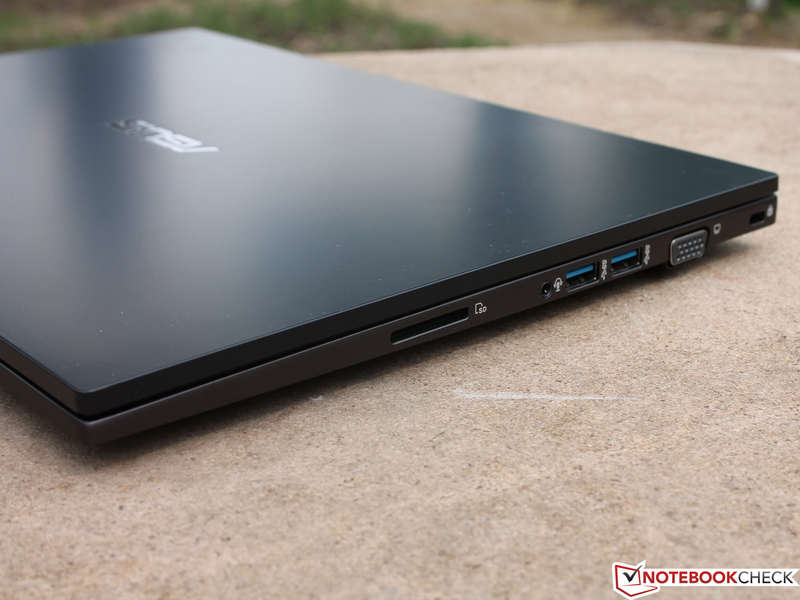 The office ultrabook was not designed for gaming although some up-to-date tracks run smoothly even in medium details and the native HD resolution. Hitman requirements proved to be too high for the hardware and the user would have to use low details and a resolution of 1024x768 pixels. HD 4000-only systems could not render either of these games to start with (Hitman: ~19 fps; Sleeping Dogs: 23 fps). The noise development is within a tight range owing to the SSD and a permanently, but quietly spinning fan. The dual-fans discharge the warm waste heat from below the hinge and are always active even during longer idle periods. We measured consistent 30.3 dB(A). This changes during the simple load test and in the stress test. The measuring device recorded a noise pressure of up to 41 dB(A). Moderate load, measured during 3DMark 2006 (mix of GPU/CPU load), resulted in 38 dB(A). Among the contenders, the ThinkPad T430u, X1 Carbon and Latitude 6430u stand out with lower load emissions (33 / 32 / 32 and 36 / 35 / 33 dB(A) during load and stress test). This is a bit surprising in view of the seemingly well-considered dual-fan strategy. The BU400VC's keyboard and wrist rest remained cool at idle. The bottom and the keys only heated up a bit more as can be seen in the graph. The temperatures quickly increase during steady load. This particularly affects the hot spots in the direct vicinity of the CPU/GPU. The AsusPro can then still be used on the lap because the warmest spots are in the center. We checked the processor's clock rate for thermal throttling in a multi-hour extreme test. The clock fluctuated between 800/1800/2500 MHz every few seconds. Meanwhile the graphics card remained constant at 715 MHz. This indicates CPU throttling because the clock constantly falls below the default rate of 1.9 GHz. The processor is not a bottleneck though. 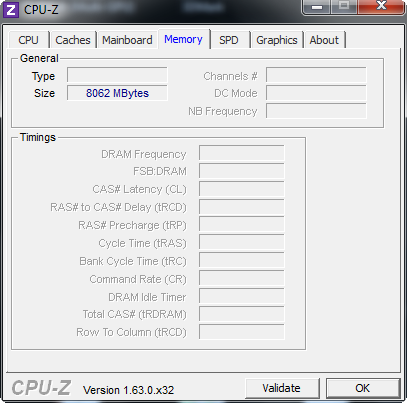 When only the processor was under multi-core load, the clock remained steady at 2.8 GHz. 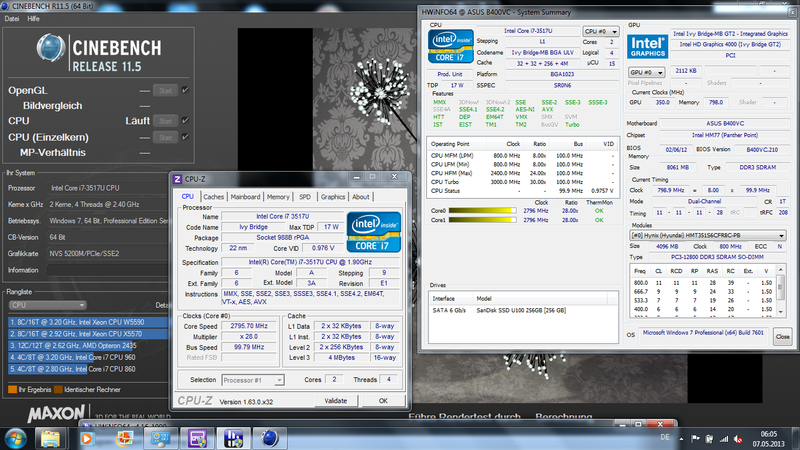 The i7-3517U is then at the upper end of its Turbo range of 1.9 - 3.0 GHz. The evaluated CPU benchmarks in the performance section are thus on the usual high level of this CPU. The extreme clock fluctuation is unimportant for practical use because it only occurs when Prime95 and FurMark run simultaneously. 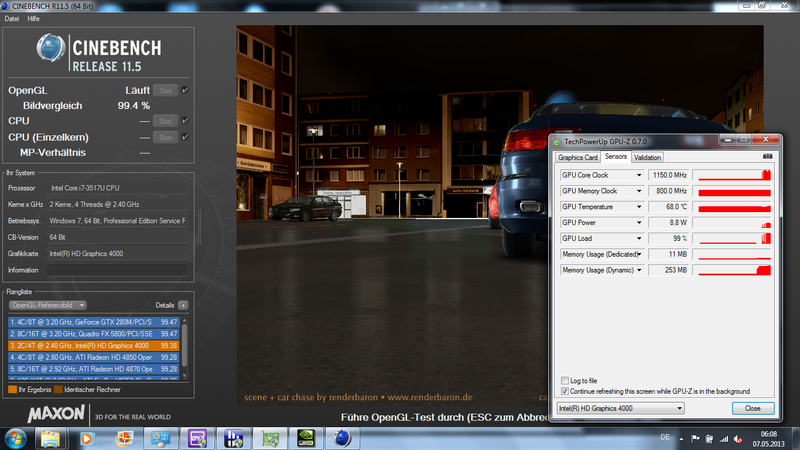 The clock again increases to 2.8 GHz as soon as the graphics stress test is finished. 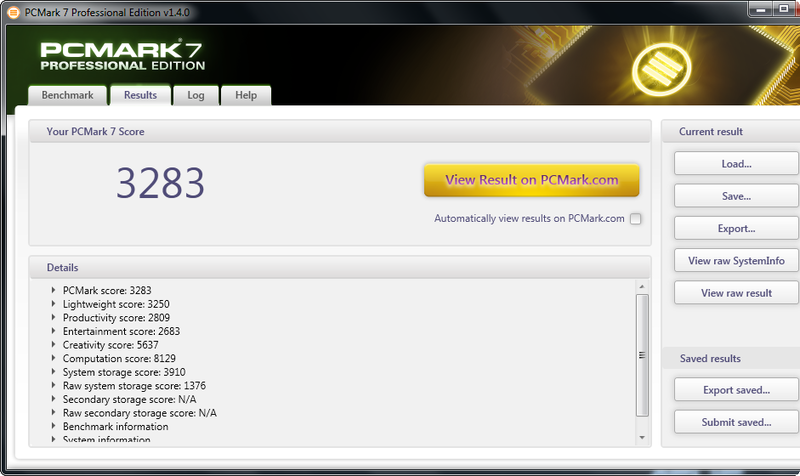 3DMark 06 performed after the stress test finished with the same score as after a cold start. Two speakers are located on the device's bottom and radiate their sound toward the table top. The speakers feature an amazing amount of bass and generate a decent sound volume. The wrist rest vibrates when the bass in electronic music is rendered. Even trebles are rendered without distortion and appropriately differentiated. It is also agreeable that they do not distort in maximum volume. This enables filling a medium-sized room with speech or music in a clear quality during a meeting. In fact, the little speakers managed to impress us a bit. 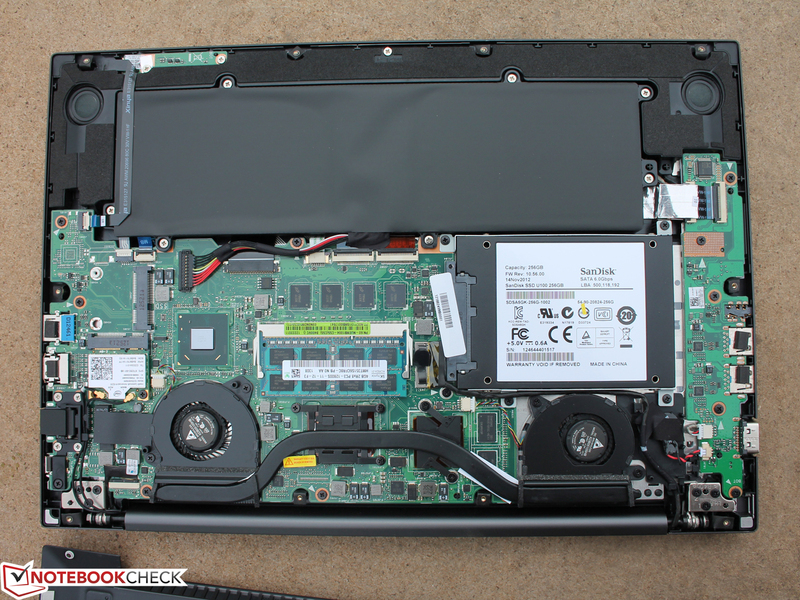 We did not expect such a balanced sound from a slim office ultrabook. The only flaw we noticed was the automatic volume control. The volume increases and decreases subtly when music is played. We could not turn this off in the VIA HD Audio Deck. However, this tool supplies several enhancement options for the speakers and microphone, e.g. room correction. The power consumption during the stress test confirmed the above ascertained clock fluctuations below the default rate of 1.9 GHz. The gauge recorded instabilities ranging from 43 to 52 Watts from the mains. 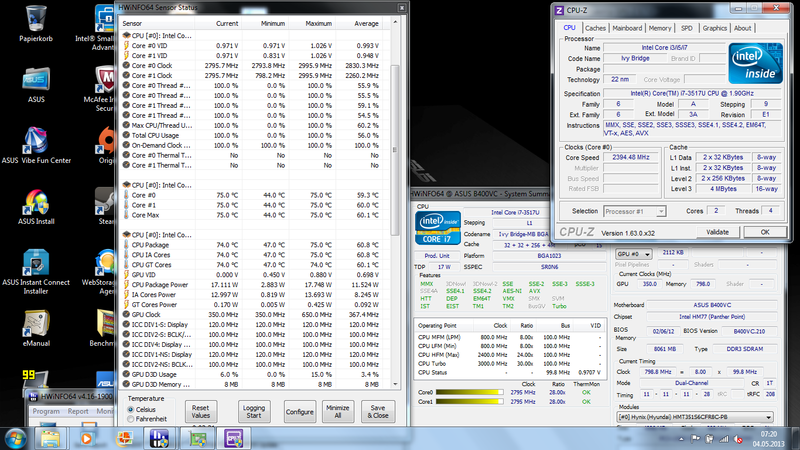 A Prime95 CPU-only benchmark consistently drained 34.6 Watts from the outlet. 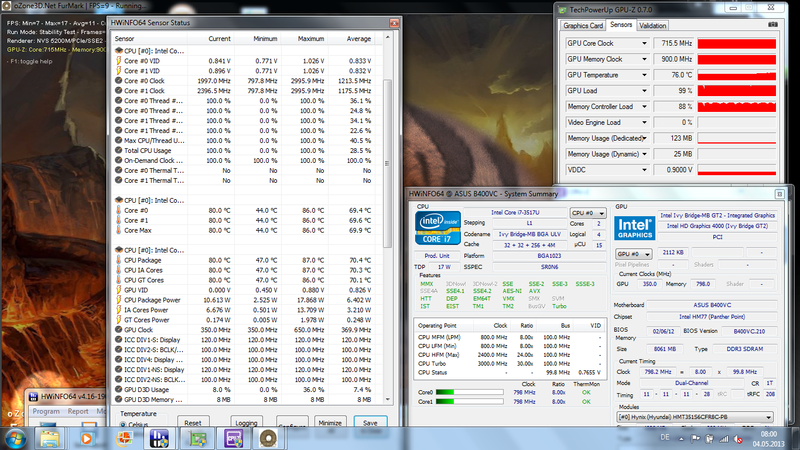 The BU400VC consumed almost the same amount of power in 3DMark 2006 as in the stress test because of this throttling. When the processor would keep the Turbo Boost constant, the stress test power consumption (second figure) would be at least 10 Watts over the 3DMark 2006 power consumption (first figure). The battery runtimes are on a low level compared with the contenders. 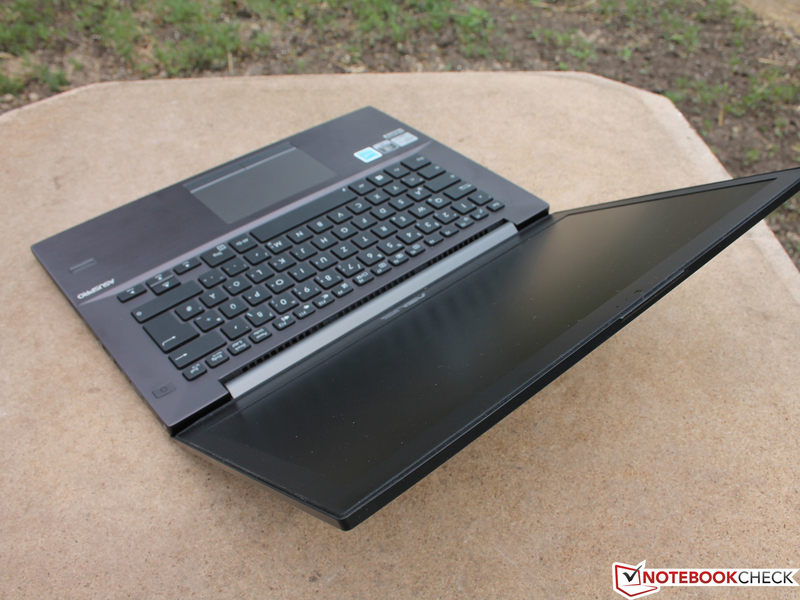 In particular, the Folio 9470m and Latitude 6430u clearly last longer than the BU400VC. We measured 8:10 hours at idle and minimum power consumption. It was 6:25 hours in the practical Wi-Fi surfing test with a brightness of 153 cd/m². Those are basically good rates but the competition lasts longer. The battery has a capacity of 53 Wh. 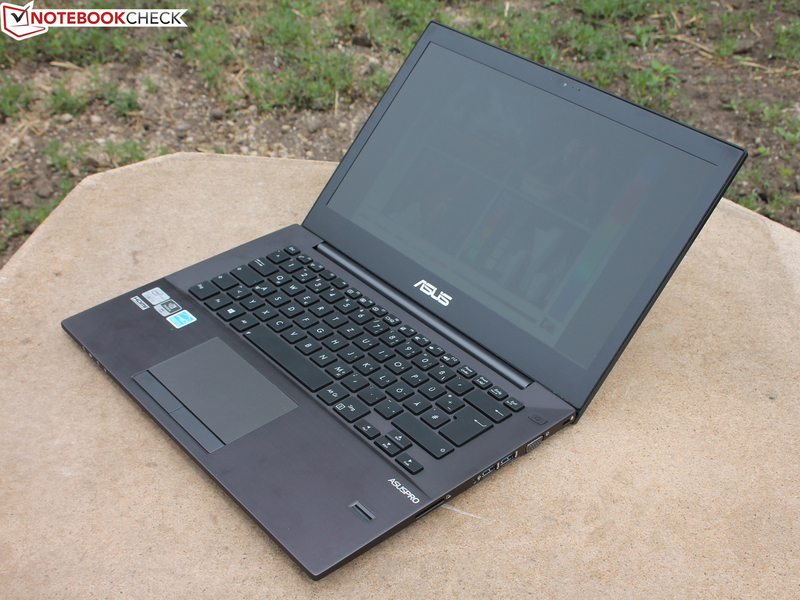 Which qualities are must-haves for a slim business ultrabook and which are an extra nice-to-have? In our opinion, the screen should definitely belong to the first category. Why Asus installs a possibly low-cost HD screen with a low brightness here is incomprehensible. The poor color reproduction according to sRGB is compensated by the high contrast. However, the too low average brightness of 177 cd/m2 clearly impairs outdoor use. That is actually too bad since the list of other advantages is long. The unibody chassis has a pleasant feel, typing on the keyboard is first-rate and Window 7 runs swiftly alongside the SSD and Core i7. Besides that, there is the bonus of a small, dedicated graphics solution and the great maintenance and upgrade options. 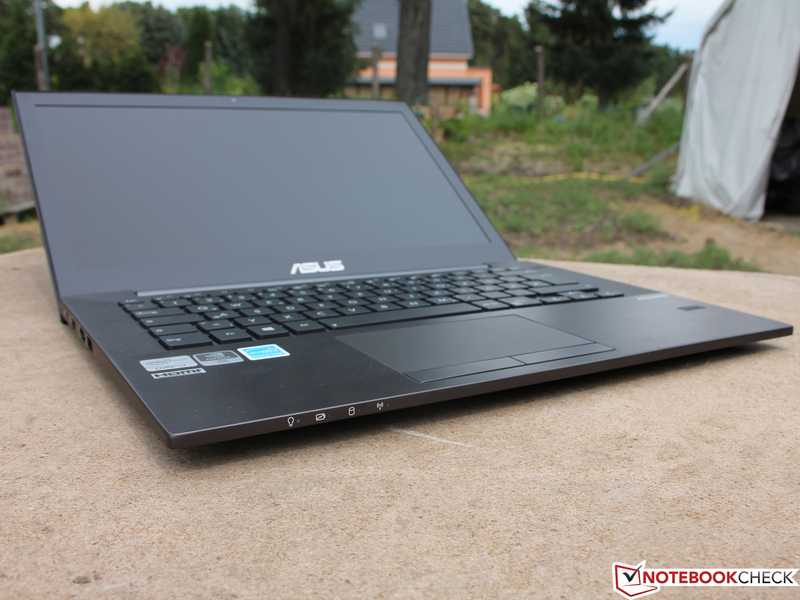 Buyers who are willing to spend 1250 Euros (~$1630) for a business ultrabook will find a decent datasheet-configuration in Asus' device (Core i7-3517U, 256 GB SSD, NVS 5200M), but Dell's Latitude 6430u is overall better in mobility (runtime) and screen (resolution, brightness). The HD+ version is available from 980 Euros (~$1278). HP's EliteBook Folio 9470m is almost prohibitively expensive at 2000 Euros (~$2608) in a similar configuration and the same is true for the X1 Carbon. Thus, the ThinkPad T430 would be on the shortlist, although it features an equally low-brightness HD screen (contrast of only 227:1). 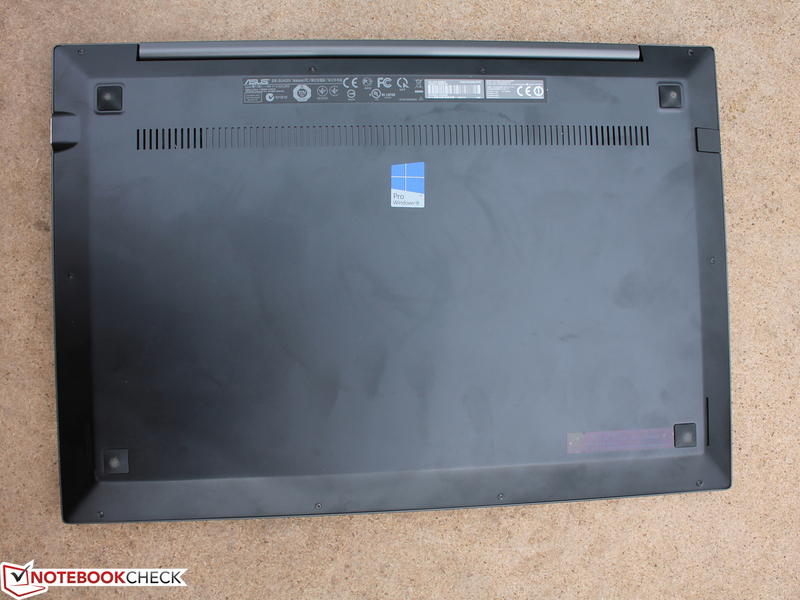 Therefore, our clear favorite is Dell's Latitude 6430u HD+. can take delight in that. The matte screen is disappointing. Only HD resolution and low brightness. but features a very accurate build otherwise. and is rigid and stiff. Asus does not omit VGA or Ethernet. ...are accessible for maintenance or upgrading. ...is fastened with several screws. The unit features 53 Wh. Empty mSATA slot (for SSDs). ...now features a new squarish design. ...and a first-rate key drop. Almost three millimeters - that is close to desktop keyboard standards. The runtimes clearly lag behind that of the contenders. First-rate build. That is a highly stable aluminum unibody chassis. 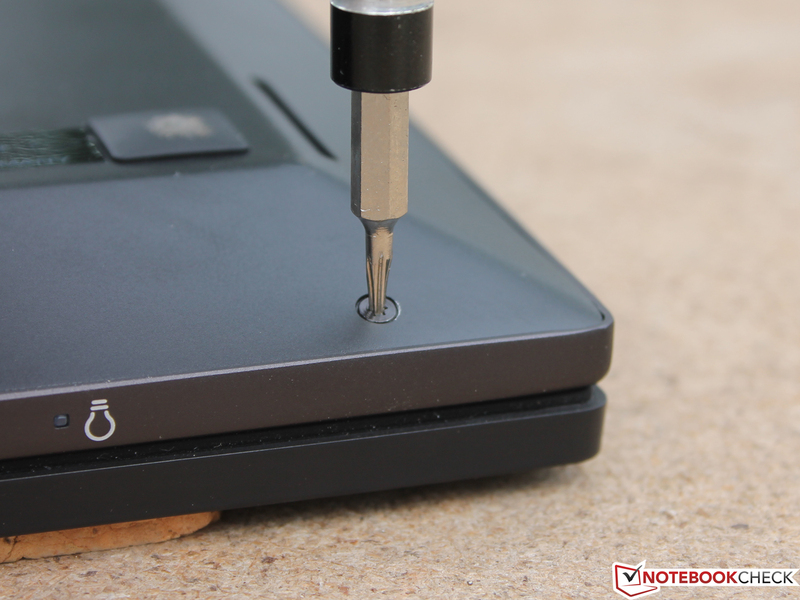 A key drop like in the full-blown ThinkPad, EliteBook or Latitude E series machines. 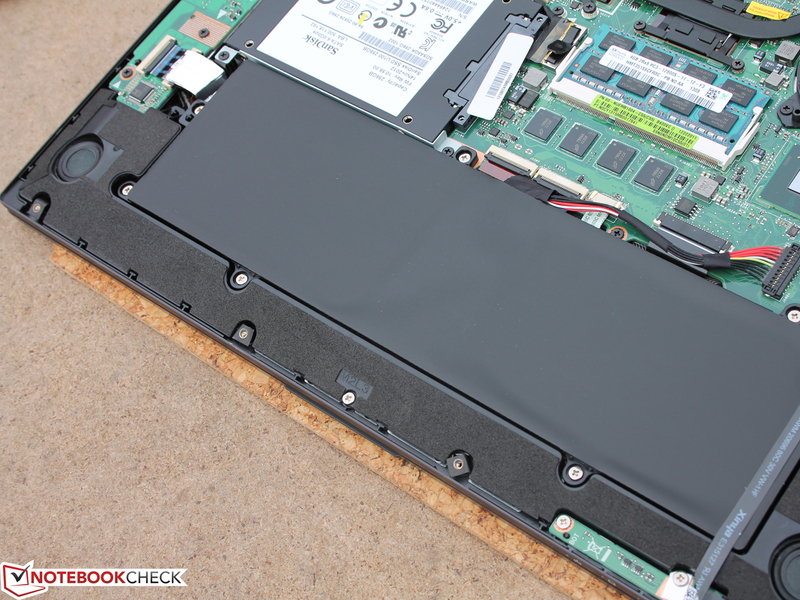 Changing the battery or upgrading with an mSATA SSD is possible. A docking port. The user can only fall back on a USB dock this way. There is no HD+ alternative available, even for a surcharge. 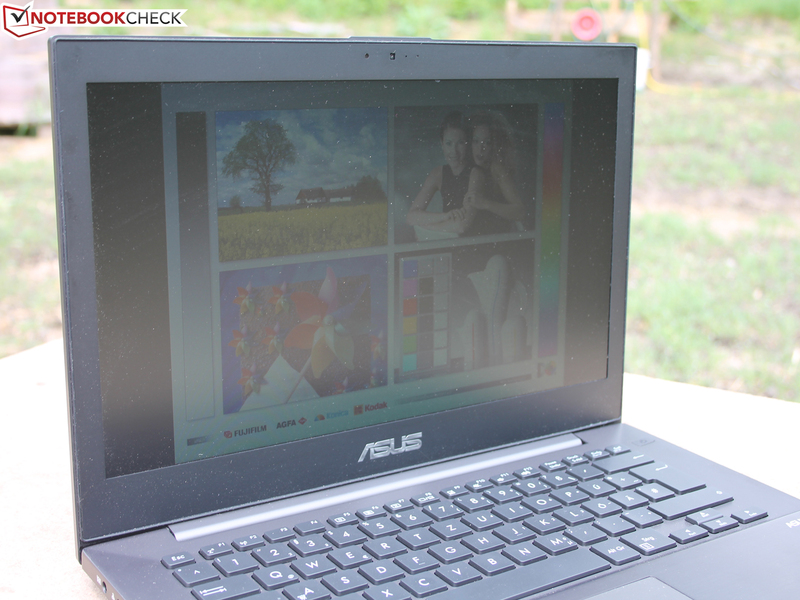 The weak screen blatantly clashes with the high quality of the other ultrabook properties.